This past July (way to stay up-to-date Spengs) Art Asylum, a Diamond Select Toys brand announced and showed off series 2 of their The Real Ghostbusters minimates. Series 1 gave us both Ray and Egon, for some reason ($$$) even Janine. 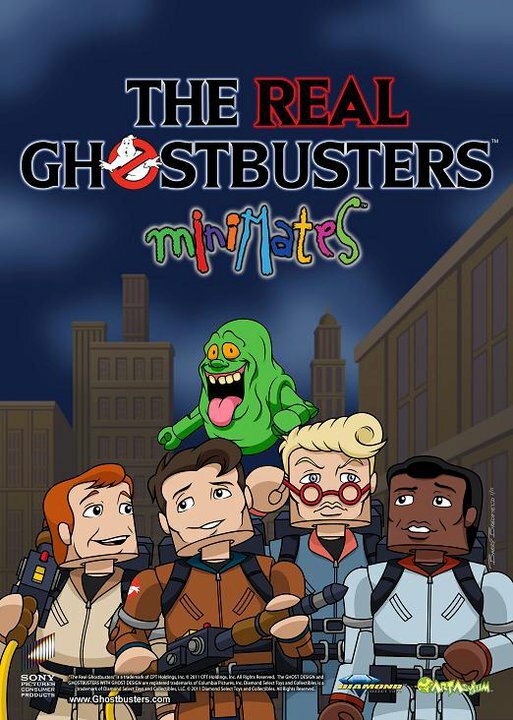 Their friends and fellow The Real Ghostbusters wouldn’t be around until Series 2. We’re also getting their faithful accountant Louis Tully (in uniform) and a happy Mr. Stay Puft. That’s what happens when you remove Gozer from the traveler. It couldn’t get much better then that. Ah, but it does. Series 1 brought us Boogieman and Sam Hain. Series 2 bring us two more early season The Real Ghostbusters ghosts, Sandman and Killerwatt! Plus we get a “no ghost” logo ghost, part of a TRU exclusive. Disappointed Louis isn’t just The Real Ghostbusters faithful accountant? Ever wish Mr. Stay Puft would just relax and dress casually? I could have been prepared to bring the big little guy to J.C Penney, Art Asylum has us covered. If your comic book store is as with it as they claim, they’ll (along with a speciality store, hmm) be selling an exclusive box set. Series 2 should retail for $17.99 USD each and is estimated to be available on September 28, 2011.